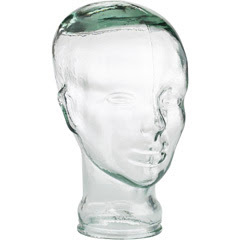 What started as a joking assertion that my apartment has a disembodied-head theme has started to really take hold. 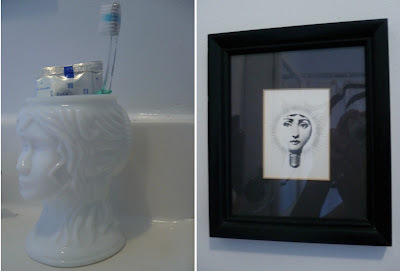 I will say one thing for it, morbid as it may appear: it's really, really easy to get good decorating ideas when one has a theme. The phrenology head started it all, so we can blame Junk Science. You walk into my house, and you're immediately greeted by a wall of disembodied heads: mugshots from the flea market, and silhouette cutouts. 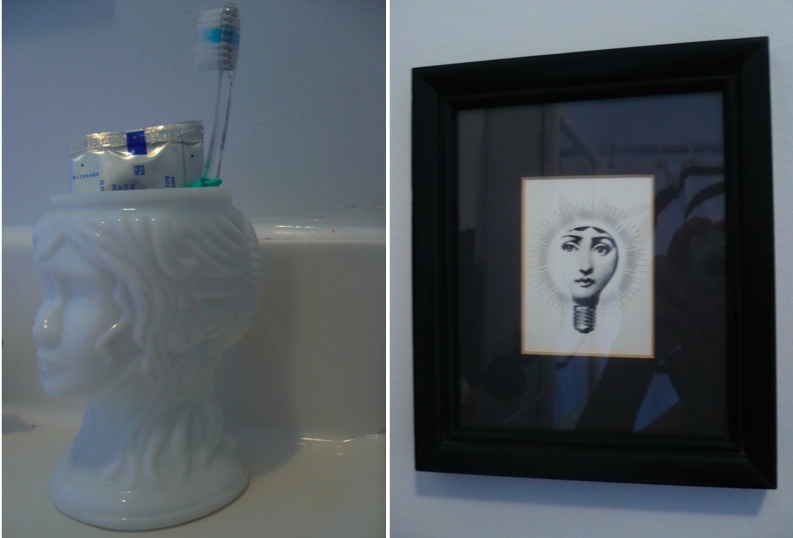 The most wondrous room for disembodied heads is my bathroom. No, I don't really know why. But when the white lady-head vase joins the black and white lightbulb head, and you realize you have a great black and white photo of a line of wigs on wig-forms, you just sort of roll with this. It's really no wonder that I've started to think about expanding the collection. 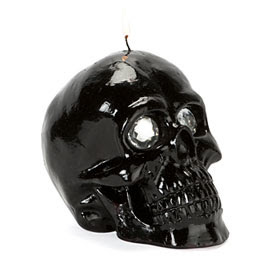 My lusted-after amber skull in a bell jar is gone, tragically; I'm considering filling that void by creating a little shelf of tiny black skull candles in my living room. I want them to be tiny: somehow, I am convinced that a line of five 2" high glossy black skull candles would be fantastic, and not Hot Topic Goth circa 1998. My parents, who remember my short-lived goth phase, may disagree. I think a life-sized glass head could go quite well in my bedroom. No, seriously. You can all begin backing away slowly now and making the "girl is crazy" eyes at eachother, I suppose.